I often hear Christians saying something akin to “If I’m wrong I’ll be all right anyway. I will have lived a good life and then I’ll just die.” That makes sense to them, but is it true? Several deities, even before Jesus, were purported to be the son of a god: Horus, Krishna, Mithra. (Even Alexander the Great was supposedly the son of a god.) If I should worship Horus my whole life, being the very best person I can be, can I then say, “If I’m wrong I’ll be all right anyway. I will have lived a good life and then I’ll just die”? If this isn’t true about Horus, then it’s not true about Jesus either. If Christians are wrong about Jesus, when they die they will be right where the Horus worshiper is if he is wrong. I know some will say, “But Jesus is different. He’s not like Horus or Mithra or any other god. Their original story didn’t include a virgin birth [or whatever the claim might be].” Well, originally neither did the story of Jesus. We know that the miraculous virgin birth of Jesus and his resurrection from the dead weren’t part of the original documents contained in the Bible, so the stories of Horus and Mithra are really no different from the story of Jesus in that it takes faith to accept any of them. When my children were small I didn’t teach them that Santa Claus was real. My thinking was that if I lied to them about Santa, eventually (when they learned the truth) they would think I lied to them about Yahweh and Jesus too. It didn’t occur to me at the time what the implications of my thinking were. 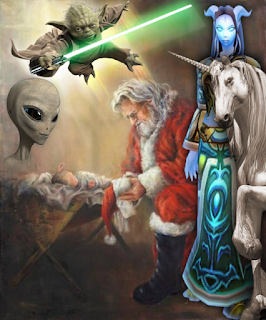 I was admitting to myself that Yahweh, Jesus, and Santa are all beings we can’t prove. And the only way my children would accept Yahweh and Jesus is for me (their mother) to tell them Santa wasn’t real but Yahweh and Jesus were. That’s it. That’s all I had: my word. And it’s all anybody has. Oh yes, we can point to an old document that says Yahweh is real. We can do the same for Horus or Mithra or Isis or Dionysus. The Sumerians had writings. So did the Egyptians and other cultures. But we have ignored them and clung to the writings of the people of Israel. Those writings were later taken by Christians, culled and edited, and put together in a book they declared to be the word of a god. So, as I think about it, my word as my children’s mother is as good as anybody else’s word. After all, it’s my word or the word of some old sheepherders and fishermen I don’t even know existed, let alone whether they might have lied or been smoking something funny. And, really, don’t most of us believe what our parents taught us? If we were born in India we might believe in Kali, but we were born in the “Christian” nation USA. Therefore, it’s the Bible or nothing at all for us. That’s what our mommies taught us. But maybe Christians are right. They may be okay whether they’re right or wrong about Jesus. Maybe we all will be okay no matter what deity we concoct. We certainly have as much right to write down our thinking and pass it around as the Jews and Romans did. We can accept what some other human being said or wrote, or we can come up with our own ideas. God didn’t speak to us, and I have a sneaking suspicion he/she/it didn’t speak to anyone else either.